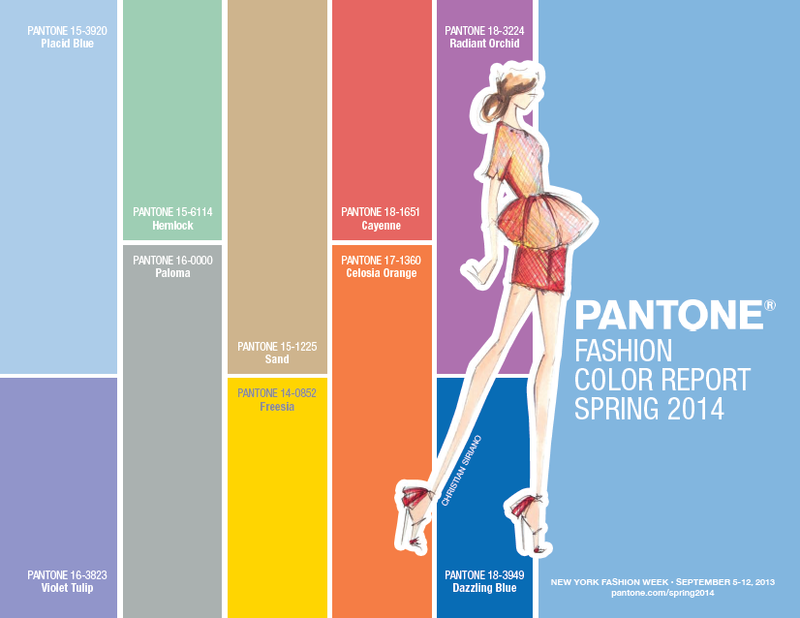 Curios and Dreams | Makeup and Beauty Product Reviews : Pantone Fashion Colours Spring 2014! "inspired by a mixture of blooming flowers, travels abroad and strong, confident women." Now coming to the breakdown, what we have here are three subtle pastels- Placid Blue, Violet Tulip and Hemlock. Placid Blue, like the name suggests is tranquil and exudes a sense of calmness and peace. Violet Tulip is very vintage-y and cool too, I'd really like a floaty summer dress in this colour! Hemlock, with it's grey undertones is muted and hence, can be paired well with almost all the shades easily. Sand and Paloma are present as sophisticated neutrals, one warm and the other cool. They serve as perfect backgrounds to let the other colours shine through. Paloma though, is interesting enough to stand alone, and very corporate-ish in my opinion. Coming to the popping colours of the season! There's Freesia, a bright sunny yellow that will set your wardrobe ablaze, Cayenne a spicy red to add some impactful heat, and Celosia Orange inspired by the velvety blooms is bold and exotic. The palette finishes with the two rich colours, Radiant Orchid (which is also the Colour of The Year 2014!) and Dazzling Blue. Radiant Orchid has already been covered in detail here, and Dazzling Blue is by far my favourite as it has such depth and directional beauty! It's strong and jewel-toned, perfect for complementing out Indian skin. You can work around with them as you please. Teamed with pastels, they provide energy to the look. With neutrals, they form a completely balanced combination. With the bolds they look confident and vivacious. So that's the whole palette covered. Did you like it? What's going to be your signature colour this season? Do spill the beans, we'd love to hear!